Fish Girl Writes: That Kiss! Not all is well in paradise..
A Valentine's Day draws near I’m seeing more pictures and .gifs of the trademark behavior of the kissing gourami. I’ve also heard a few people planning to purchase these fish as gifts for loved ones. Neither of these actions are as sweet as you might think. I’ll explain why. The kissing gourami is a unique gourami in that it is the only species in its family Helostomatidae. They lack the long ventral fins of other common gourami but still maintain that gourami attitude. They are feisty and will put on displays to keep others from their territory, but they display by lip-locking. This appears to people as if the fish are kissing, but they are actually fighting to drive the other fish off; they push against each other until one fish backs down and swims away. 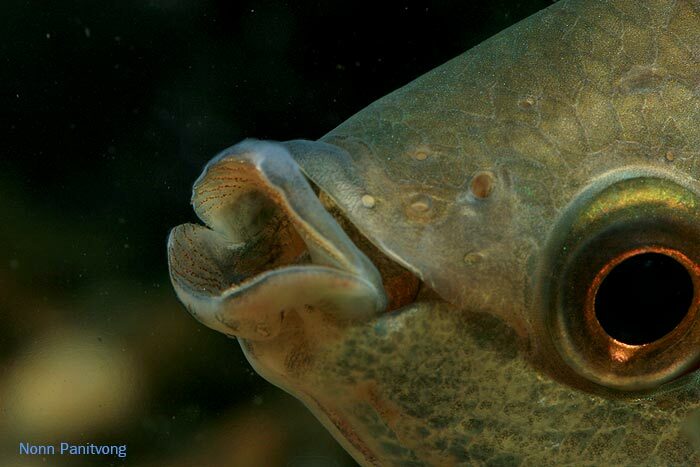 The thick lips of the kissing gourami were originally developed for rasping algae and other microorganisms from branches and leaves in their ancestral swamps. In the aquarium they will do this to plants as well as the walls. This is why you will often see them “kissing” everything in the tank. Because they have such powerful jaws, they will often tear up the leaves of plants in attempt to eat what grows on the surface. As they grow, they will consume smaller fish that they are housed with like small tetra, danio, and rasbora. This fish also gets much larger than most of the common gourami. What you see in the small store tank are just the juveniles. Most specimens top out between 10 inches (25 cm) and 12 inches (30 cm) long. Tropical Fish Hobbyist magazine recommends a 75 gal (283 L) as the minimum size for a single adult; groups need much larger tanks. When they are fully grown, those two little babies that used to ‘kiss’ each other will be large and territorial. It’s not uncommon for the larger fish to harass the smaller one to death. This is not to say they can’t be kept together, but two fish almost a foot long each require a lot of space to ensure each fish has its own territory. Now you may be thinking that I just ruined your Valentine’s idea for the fish-lover in your life. But fear not, for he or she would have been very unhappy if you put two of these fish in her or his tank without asking first. There are much better ideas, and I don’t mean a red betta in a vase. I’ve seen some small heart-shaped aquarium decorations that would be darling to surprise your fish-lover with. Nothing like waking up and finding a heart in you aquarium to know someone loves you. Gift cards are another great option especially if you know that special someone is looking for a specific item. And there is always jewelry. I’ve seen some very beautiful fish necklaces and earrings. So this weekend when you are out shopping for that special someone in your life, leave the kissing gourami in the store. Your fish tank (and your significant other) will thank you for it. Most tanks can't house a surprise belligerent 10 inch (25 cm) fish that eats your aquascape and tetra. "Helostoma temminkii, Kissing gourami." fishbase.org. Updated: 3 July 2012 Retrieved: 7 Feb 2013. "Helostoma temminkii (Kissing gourami)." Seriously Fish. Updated: 2013 Retrieved: 7 Feb 2013.